The Wikitecture Interface is made up of 2 major components, the 'trunk' and archiving 'canopy' above. The lower 'trunk' is reserved for most of the functionality. The spherical 'archive leaves' above however, are for storing the individual design iterations throughout a typical project. Although not always the case, the general rule will typically apply: one spherical 'archive leaf' = one design iteration = one contributor. 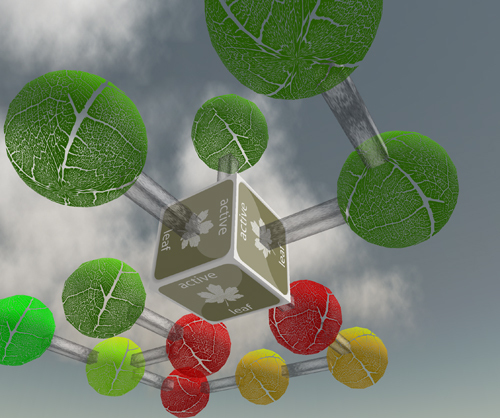 If you click or 'touch' one of these leaf spheres, the design contained within, will rez itself out onto the parcel. 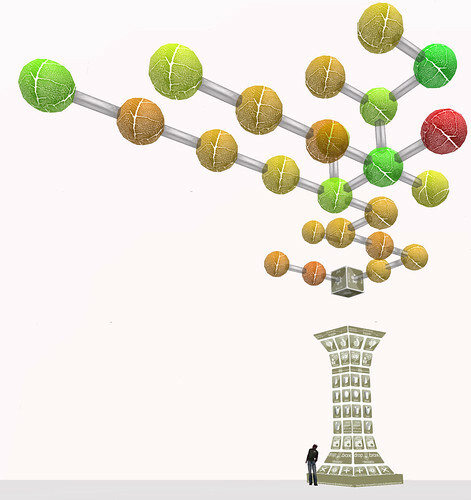 The 'trunk' of the 'Wiki-Tree', is divided into 3 general areas of functionality - the top, middle, and bottom. 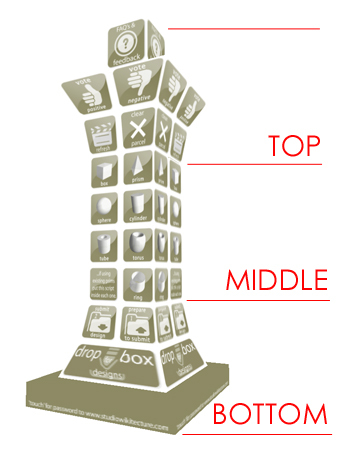 The group of buttons toward the top, when 'touched' (right click…touch) will perform their particular action on the design that is currently active on the parcel. 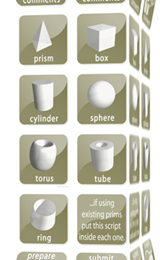 The buttons in the middle section, when touched, will give you a copy of the specified prim: box, prism, sphere, cylinder, tube, torus, and ring. These prims are special, in that, they contain unique scripts that communicate with the 'Wiki-Tree'. They are also have all the permissions set, so others can modify your design. The buttons located on the bottom are used when submitting a design to the canopy of 'archive leaves' above. As mentioned before, each spherical 'archive leaf' above this main 'trunk' interface holds one design iteration, usually contributed by one designer. The proximity of one ‘leaf’ to the next indicates that the designs contained within, are very similar derivatives of each other. The further away a ‘leaf’ is from another, indicates either a major change in the design direction or an entirely new direction all together. The animated texture 'shooting' between two ‘leaves’ indicates the direction the designs have evolved from one another - such that one will be the 'parent' of the adjacent child leaf. The color of the leaf correlates with the number of votes its particular design has been given by the community. For example, the more green a leaf, the more votes… yellow has less…and red, the least number. In order that the tree doesn’t get too elaborately huge, there will be a point where the 'canopy' will 'prune' itself of the lowest ranked designs. The pruning process starts kicking in around 30 leaves of so. As i mentioned before, in order to rez out the design contained within a particular leaf, just touch the sphere. It will first delete whatever was on the parcel and proceed to rez out the design iteration contained within that particular 'leaf'. Once touched, you will notice the tree shouts out something like this: "Rezzing Design #1193625379 in the viewing area…"
(be aware, occasionally it takes awhile to rez out the design onto the parcel. In fact, sometimes the system gets hung up, mid operation and does not rez the design you wanted. If you find that the design, even after a time, does not materialize onto the parcel, you have to press the button, at the top of the trunk, that says "refresh", or simply click the leaf again. Moving on down the 'trunk' of the tree, we come to the voting buttons: 'vote positive' and 'vote negative'. By touching these you will apply either a positive or negative vote to the design that is currently on the 'viewing parcel'. In order to avoid someone bombarding the tree with votes, each contributor will only be allotted 3 negative and 3 positive votes. As is currently designed, if after placing your allotted 3 positive/negative votes, the next positive vote you cast will replace your oldest vote. In other words if the 1st vote is the oldest, placing a 4th vote will replace this 1st vote. In addition, you can only vote for your fellow contributor's design. We feel if members are able to vote on their own designs, there's a greater likelihood of watering down the 'wisdom of the crowd', so to speak. Go to http://www.studiowikitecture.com/Gyatso/all_designs.php5 and after loggin in, go to the 'all designs' page. Once there, click on the 'more info' button for the design you would like to comment on. Once there, simply type in your comment in the text field. People might find this forum more useful when it comes to teasing out more generic design ideas, not associated with any particular design (leaf) saved in the canopy. It is really up to you though. We advise however to follow both sites. Uploading your snapshots to http://www.studiowikitecture.com/Gyatso/all_designs.php5 website. Although not a 'button' on the 'wiki-tree', another powerful method to communicate your designs to your fellow contributors, as you submit your designs to the 'canopy', is to take snapshots of your design and upload them to corresponding leaf profile on the http://www.studiowikitecture.com/Gyatso/all_designs.php5 website. If you go to the 'more info' page of any particular leaf you will see where you're able to upload images. To upload images, however, the leaf needs to be yours and you need to be logged in. Continuing down past the 'take scene' button we had mentioned before, we come to the scripted prim buttons. As mentioned before, these buttons, when touched, will give you a copy of the specified prim: box, prism, sphere, cylinder, tube, torus, and ring. Touching any of the prim buttons, will rez out that particular prim just north of the 'trunk'. After which you can move it over to the parcel and reshape… add textures… copy… etc. As mentioned before, these prims contain a unique script that communicates with the 'wiki-tree'. Since this unique script will be copied as well when the prim is copied, it eliminates the need to go back to the 'wiki-tree' and get a new prim. Again, you will rarely, if ever, have to pull a new prim out from the 'wiki-tree' once the design has been started. …if Using Existing Prims Put this Script inside Each One. If by chance you have an existing design you would like to save to the tree, make sure each and every prim contains this unique script. To get the script just touch the button that says, "…if using existing prims put this script inside each one." After receiving it, just drag it from your inventory to the 'content tab' of each prim. Moving on, we come to the buttons you will use when submitting your design iterations to the archive 'canopy' above. In order to illustrate how these buttons work, i will take you through a hypothetical scenario. Let's say as you were rezzing out designs from the 'canopy', you came across one you would like to work on, you can take one of two approaches. You can either work on your design on the viewing parcel, or take that design into your inventory and work on it on another isolated parcel. Again, if you are working on the viewing parcel, don't walk away from your work without saving it to either your inventory or the 'leaf canopy', because someone might come by and accidentally delete it. The best approach, is to take a design into your inventory and work on it on another isolated parcel. That way, you eliminate the potential, all together, of someone accidentally deleting your design; which inadvertently, happens quite a bit, as people click their way through the archive leaves. Select all the objects on the parcel, right click and 'take…' them into your inventory. After which you can go to an alternate, isolated parcel and work on your design in peace and without the risk of someone else deleting it. When you're done and are ready to submit your design back to the canopy jump to step. After working on your design on another parcel, come back to the 'Wiki-Tree' parcel and click on the leaf of the design you based your modified design off of. This will, of course, rez out that particular design on the parcel. Performing this step, allows you to be sure that the 'active leaf' above, is the design your new submission will be branched off of. 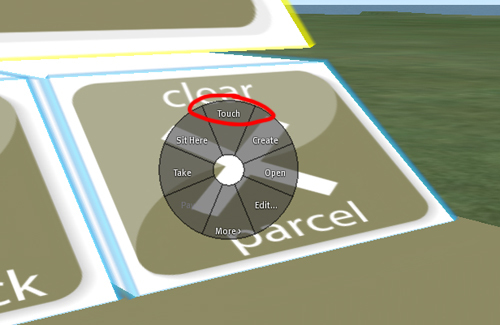 Once that parent design is rezzed out onto the 'building parcel', hit the 'clear parcel' button. 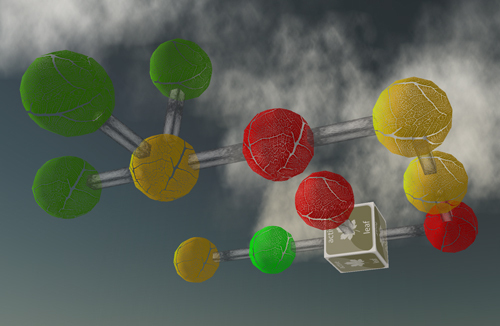 So with a clear parcel, rez out your new design iteration from your inventory onto the parcel. You will most likely have to relocate the design to fit accurately on the parcel again. Once your design is positioned properly on the parcel, jump to step 4. After finding a design, simply do your modifications on site. After you're finished tweaking the design go to step 4. When ready to submit, simply touch the 'prepare to submit' button. Once the information has been recorded, (build control panel shouts: Information recorded) select all the prims that compose your design iteration, right click on any one selected prim and go to 'take…'. This will send what was selected to your inventory. To help assure that you don't select other prims outside the design, it helps checking the 'select only movable objects' under the 'tool' menu. After taking your prepared design into inventory, right click on the design in inventory. Left click on properties and you'll see a window which shows the permissions as the Wikitree scripts will see them. In this window, make sure that all three Next Owner permission boxes (Modify, Copy and Resell/Give away) are checked. Then close the window. Clicking on 'edit…' should bring up a 'dialog box' that looks like the following image. Click on the 'Content' tab of this 'dialog box'. After saving or dragging your design from your inventory to the 'contents' tab of the 'drop box', touch the 'submit design' button. After hitting 'submit design', a new 'child leaf' will rez itself off of the 'parental leaf'. And as mentioned before, the animated texture 'shooting' between two ‘leaves’ indicates the direction in which one evolved from the other. After that, congratulations, you just saved your design to the canopy. If inworld, you can also click on the floating box above the Wiki-Tree's trunk to get a link to this forum as well. If you have any questions please don't hesitate to IM either Theory Shaw or Keystone Bouchard in-world and we can come by and help you out.